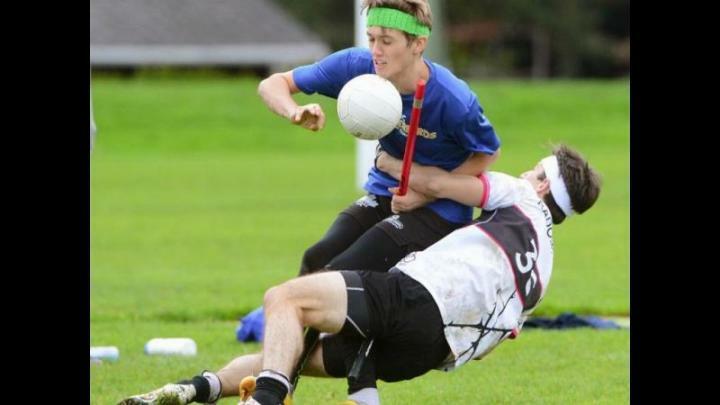 The Harry Potter-based sport of quidditch sweeps Surrey. Nov. 14, 2016 3:00 p.m.
Quaffles, bludgers, snitches, hoops and brooms – those were just some of the pieces of equipment seen at the Quidditch Western Regional Championships at Sullivan Park on the weekend. Over two days, six Canadian university teams vied for top scores in the game invented by Harry Potter author J.K. Rowling. It’s got elements of rugby, handball and other sports, with positions filled by a keeper, three chasers, two beaters and a seeker, each holding a broom between their legs during the action. Quidditch is the only Canadian university-level sport that is co-ed, with at no more than four players from one gender of seven players on the field at a time.